In less than three weeks, Donald Trump will be the president of the United States. As I think about how Christians are called to live in the midst of this global moment of increasing populism, authoritarianism, and nationalism, these are some of the texts I find myself returning to. William Stringfellow, An Ethic for Christians and Other Aliens in a Strange Land. For the last eight years, it’s been possible to think that society is on a steady march forward. Not always in a straight line, of course, but we’ve had enough evidence to think that “the arc of the moral universe is long, but it bends towards justice.” That view seemed to shatter in the early hours of November 9. The biblical topic is politics. The Bible is about the politics of fallen creation and the politics of redemption; the politics of the nations, institutions, ideologies, and causes of this world and the politics of the Kingdom of God; the politics of Babylon and the politics of Jerusalem; the politics of the Antichrist and the politics of Jesus Christ; the politics of the demonic powers and principalities and the politics of the timely judgement of God as sovereign; the politics of death and the politics of life; apocalyptic politics and eschatological politics. Stringfellow is consistently challenging and creative in his writing and this book is an excellent introduction to his thought. the capacity to imagine ourselves in a web of relationships that includes our enemies; the ability to sustain a paradoxical curiosity that embraces complexity…. ; the fundamental belief in and pursuit of the creative act; and the acceptance of the inherent risk of stepping into the mystery of the unknown that lies beyond the far too familiar landscape of violence. In addition to reclaiming the apocalyptic, Christians in the Trump era need also to learn deeply from the witness of Anabaptist Christians. Lederach starts us down that path. The Kairos Document. In 1985, as the anti-apartheid struggle reached a crisis point, an ecumenical group of South African Christians published a document that critiqued what it called “state theology” and “church theology” and began to articulate “prophetic theology.” While it is shaped by its time and its context, it is still a document that speaks to our present moment. Others might point to the Barmen Declaration, written by confessing Christians in Germany during World War II. You should also read that. P.D. James, Children of Men. James’ dystopic novel (set in 2012) envisions a world in which people have lost the ability to have children. It was turned into a pretty good movie about a decade ago, one I’ve thought of often in recent years, but the movie strays pretty far from the book. The novel is well worth reading in its own right, especially for the way in which childlessness comes to stand in for godlessness. I remember being struck particularly by the quiet insights into the role of the Christian liturgy in sustaining communal life in desperate times. Reclaiming the meaning of the liturgy (a cause that Stringfellow championed, among many others) is a vital task. Harvey Cox, The Market as God. There is a lot of talk about economic inequality, both within countries and globally. But we don’t tend to talk about the penetration of market-based forms of thinking into more and more areas of our life and the resulting impact this has on how we see the world. The recent Christmas season is an annual reminder of the way in which a Christian holiday has been taken over and subverted by the great god of consumerism. Harvey Cox recognizes all of this and in this recent book (itself an expansion of a 1999 article in The Atlantic) he argues that the market has become a god in our society. To begin exploring the market theology is quickly to marvel at just how comprehensive it is. There are sacraments to convey salvific power to the lost, a liturgical year, a calendar of entrepreneurial saints, and even what theologians call “eschatology”—a teaching about the “end of history.”…. I want to demonstrate that the way the world economy operates today is not simply “natural” or “just the way things work,” but is shaped by a powerful and global system of values and symbols that can best be understood as ersatz religion. To live in a Christian in this day and age means to be clear-eyed about the other gods that roam the religious landscape of our day and compete for the faith and trust of believers. The market is chief among them. That’s my (non-exhaustive) list. What’s on yours? Recommendations for fiction are especially welcome. John Steinbeck, The Grapes of Wrath (“or anything by Steinbeck”)—heartily agreed! I re-read Grapes for the first time since high school last fall and was struck by how painfully good it is. “Something by Boenhoffer.” Also agreed. Recommendations welcome. Jesse Zink (@jazink) is the director of the Cambridge Centre for Christianity Worldwide and author, most recently, of A Faith for the Future. This evening, I turned away from the proofs and came across a piece of news that devastatingly confirmed this: George Bell, an Anglican bishop and prophet for peace in World War II, sexually abused a young child during his ministry. The Church of England has recently settled a legal claim relating to this abuse. Bell is someone I have admired through the long gaze of history. He is not a “saint” in the conventional, Catholic sense of the term, but he is commemorated in the calendar of the church. He spoke out against the carpet bombing of Germany in the House of Lords, doing in the (very credible) chance he had of becoming archbishop of Canterbury. He was later deeply concerned with the reconstruction of Europe after the war. Three years ago, I wrote this short post about him. I’m hardly the only one: Paul Zahl, an Episcopal priest, wrote a really excellent reflection some years ago remembering Bell in the context of drone warfare. Rowan Williams preached a sermon on Bell’s consecration in 2008. Re-reading it now is heart-breaking. To have lived in England for the last several years is to have lived in the midst of a constant stream of sexual abuse allegations against figures in the establishment: media, politics, and church. A retired bishop was recently jailed for sexual offenses. Bell, were he alive, would no doubt be joining him. This is clearly a time of reckoning that is not coming to a close anytime soon. We can and do pray for those who were assaulted by those in power. We affirm with the bishop of Chichester and others the truth (so often occluded in the church) that “the abuse of children is a criminal act and a devastating betrayal of trust that should never occur in any situation, particularly the church.” We make sure we listen carefully (in a way that has not always happened in the past) to their stories of pain and woundedness and praise them for speaking up over many decades. We work to prevent it from ever happening it again. In my book, I write that rather than saints being perfect people, saints are people whose lives pointed beyond their current existence to the future God will fulfill. George Bell is commemorated because in some small way a part of his ministry did this. But we know now that even as he did that, he was hopelessly, inescapably rooted in the fallen, sinful present. I hardly know what to think, except to return to the Bible: “All have sinned and fallen short of the glory of God.” (Romans 3.23) It is a tragic reminder of that central Christian truth. Friends and family in the U.S. have asked me what to make of the impending referendum on Scottish independence. I have no more standing other than that I have been to Scotland (more than once!) and am a token North American in the British Isles, but here’s one view. I generally share the view that for the Scottish to vote for independence would be short-sighted and self-defeating. But I think I can understand a tiny bit of the energy motivating the vote. There are lots of difficult and tragic situations in the world right now that need to be addressed—Scotland, independent or not, is not one of them. One danger of independence, however, is the opportunity cost. Just think of the sheer amount of energy, political capital, and people-hours that will need to be devoted to negotiating independence over the next several years that could usefully be spent on some many other issues. Perhaps the most important aspect of this whole campaign has been what it reveals about the British political class in Westminster. In this year alone, there have been two sets of elections—for local government and for the European Parliament—in which the protest party, UKIP (the UK Independence Party), has done remarkably well by campaigning against the system. The Greens, reinvented as a protest party, are now also polling better than ever. This is a trend across the north Atlantic world: in various ways in various countries, protest parties have burst on the political scene in recent years. These populist leaders skilfully channel voter discontent by directing it against incumbent politicians without ever indicating how they would genuinely work to change the system. Alex Salmond, the Scottish independence leader, is just one more such leader, successfully framing Scottish independence as a referendum on a broken system. Thursday’s referendum, however, has greater stakes than any previous such election, however, when a protest vote might be a safer bet. I do think, however, that in Britain the indictment of the political class has some merit. One of the most depressing facts about the British parliament is that the three main party leaders—all men in their 40s—and several of their top deputies have essentially done nothing else in life except attend Britain’s finest schools, work in party politics, and climb the greasy pole to the top. The trouble is that skills needed for this are vastly different from the skills needed to offer a compelling vision for the future and lead a country through difficult times. There are no shortage of photo-ops and sound-bites on offer. What appears to be missing is any evidence of personal, sustained, direct engagement with the pressing issues that affect so many people’s lives. So if Scotland votes for independence on Thursday, it will be an indictment of the political class in this country and a reminder that the politics of protest are alive and well. That would be a shame. But it would also accurately reflect the abysmal state of our politics in these last several years. And it all raises a question for another post—in the midst of our broken politics, what role is there for the church and for Christians more generally? Samuel Peni, bishop of the Diocese of the Nzara in the Episcopal Church of the Sudan, was recently at the AFRECS conference in Chicago and gave this interview. 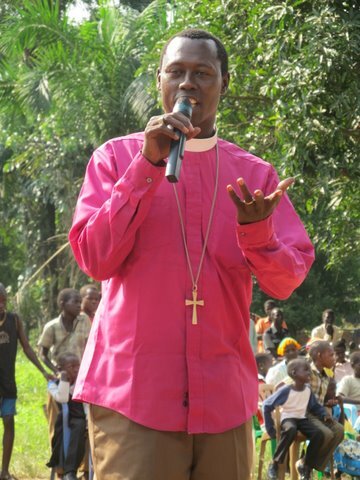 Readers of this blog might remember that I recently profiled Bishop Samuel in an article for the Anglican Communion News Service. Bishop Samuel mentions the work in his diocese to reduce mortality in childbirth. The traditional birth attendant program is underway, but the diocese is looking to expand it. More information on how to support that particular aspect of his ministry is here. 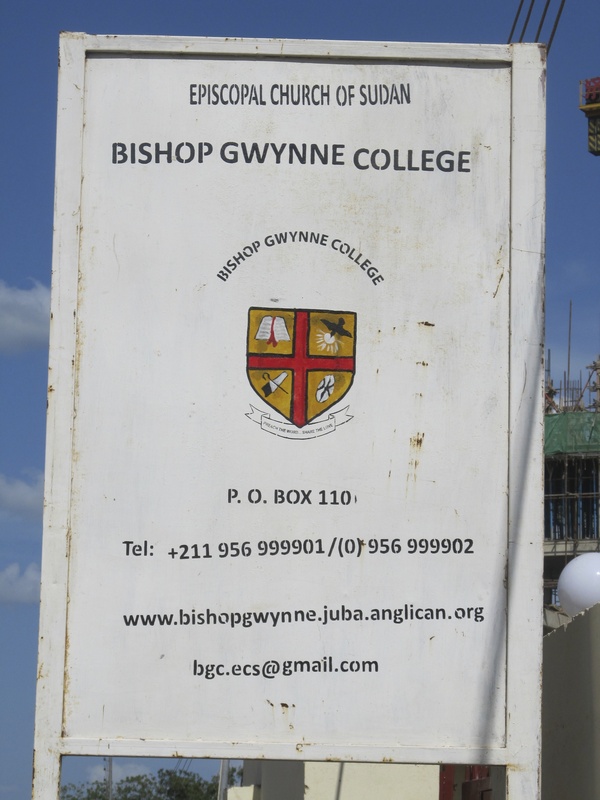 Almost exactly three years ago, I first came to Bishop Gwynne Theological College, the leading seminary of the Episcopal Church of the Sudan. I came as a student, to learn about what ministerial preparation was like in a different part of the Anglican Communion. It was my introduction to the country that became South Sudan, and I’ve been coming back in a variety of forms—theological educator, relief-trip accompanier, doctoral dissertation researcher—ever since. When I first visited, BGC had only recently re-opened after a short closure that the church decided was necessary to reassess the quality of education being offered. There were plans for a “new site” for the college, so that it could expand over time, but on that visit all that the new site held was one long, low dormitory building, surrounded by a goat market and a machine welding shop. Most of the classes, the library, and several students’ rooms were in the “old building,” the very lovely (but way too small) courtyard the college had been given when it abruptly had to be moved to Juba in the middle of Sudan’s second civil war. That building had its own drawbacks. For instance, it lacked electricity, which makes it hard to do your homework at night. My travels in South Sudan take me elsewhere now, but I still visit my friends at BGC. One of the delights of my recent visits has been to see the remarkable progress that the school has made. The old building is still in use, but it is primarily for faculty offices and the odd guest room. There’s solar-powered electricity—still limited, but better than nothing. Meanwhile, the new site has been transformed. The goat market and machine welding shop are gone. 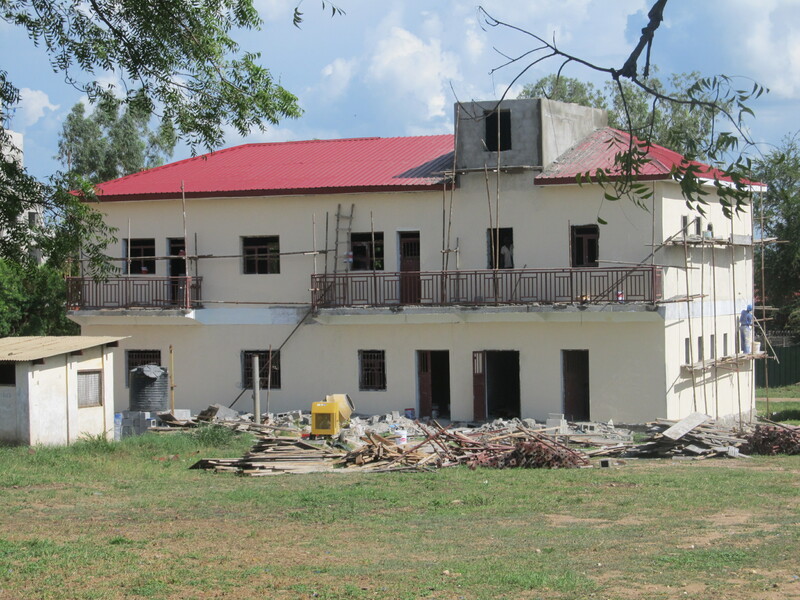 In their place are some very nice dormitories and a new two-story building that when complete (soon!) will be a lecture hall and a much-expanded library. (The library will be upstairs. Why? Because less dust makes it up that high.) There are plans for an administration building to be built, as well as a chapel. But even more impressive are the students. Later this month, about ten students who were just beginning when I was here three years ago, will graduate with diplomas granted by the well-regarded St. Paul’s University in Limuru, Kenya. One of the great strides BGC has made has been to become an accredited extension site of St. Paul’s. The diploma has greater currency to be used when applying for further study. None of this is to say that there aren’t big challenges ahead. Tragically, the college principal, Joseph Taban, died earlier this year of brain cancer, just as he was getting a full head of steam on running the place. There’s a new administration in place which is doing a superb job, but any transition of this nature is difficult. 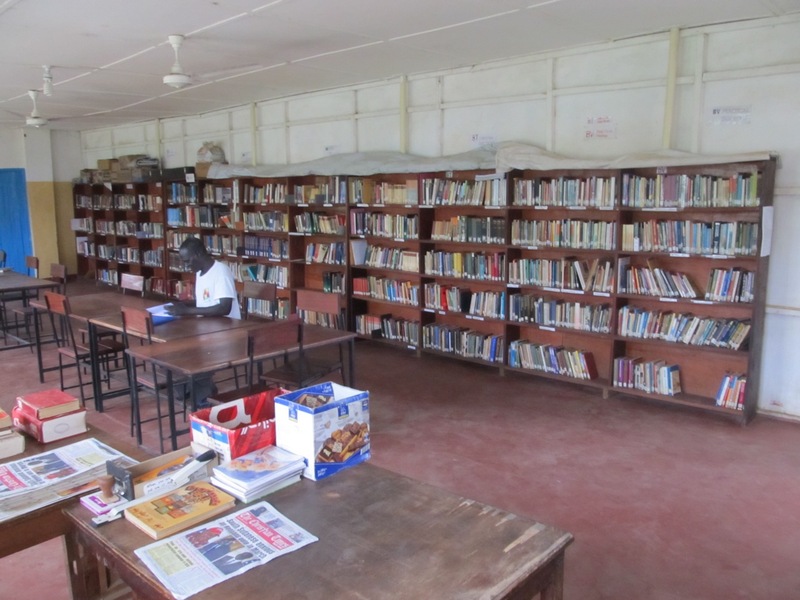 The library resources, while good for Juba, are still very limited. There’s a wealth of material available online, of course, but for that the college would need computers, something it is hoping it might one day be able to acquire. South Sudan faces a huge number of issues, as does ECS. BGC is not immune from any of this. But every time I come here and see what has changed since I first arrived, I remember that change actually is possible. Christians are the people who keep pushing and prodding and poking and pressing the world in the direction of the kingdom of God. There are setbacks and detours along the way, some self-inflicted, but change actually does happen, and there truly is reason to hope. BREAKING: On my last day in South Sudan, I went to Morning Prayer at BGC—and there was electricity! Perhaps municipal services in Juba are finally picking up! One of my favourite parts about traveling in South Sudan is how quickly I become in tune with the rhythm of the day, a rhythm that is largely governed by the sun. I wake up with the sunrise, and I am often asleep within two hours—and oftentimes less—of sunset. Back home, electricity and a whole host of other conveniences allow me to block out what is happening outside—I can burn the candle at both ends (at my peril) much more easily than I can here. During the day, my activity is concentrated in the morning and late afternoon. After lunch, when it is hot, I am fine to sit in the shade and read a book or have a nap. It’s what other people are doing, after all. And it’s too hot to do anything else. But the absolute best time of day is between 6 and 7 in the evening. The sun is setting so it is cool enough to be active. But it hasn’t set all the way so there’s still plenty of daylight to see by. As I walk through town, I am aware of all the football and basketball games that are going on. I smell the cooking fires that are preparing dinner. I hear the children running off their last bits of energy, and the creaking pedals of bicycles as people return home. The light comes at such an angle that is an excellent time to take pictures. You get a whole new perspective on something when the sunlight is not directly overhead, baking it in the sun. In some places I have stayed, this is the time of day to say evening prayer—to gather chairs in a circle in a yard somewhere and pray for the day that is passing and intercede for the world as it passes by. It is a beautiful liminal hour between day and night, between activity and rest, between the public world of our day-to-day existence and the private world of our home life. Then the sun dips below the horizon. In the gathering gloom, the mosquitos come out, generators come on, and people head indoors. The rare electricity of the generator means that it is time to charge one’s electronic devices and flip on the television. It is good to see the news of the world, and I appreciate having a charged computer on which to write items such as this. But sometimes the artificial noise can become too much, so I step outside again, look up at the stars that are appearing, and start counting down until tomorrow’s late afternoon and the beautiful hour that is coming again. My recent essay that questioned the Diocese of South Carolina’s decision to leave the Episcopal Church has generated a fair bit of comment on blogs around the world, not to mention the two response essays in The Living Church itself. There are two posts on the Anglican Down Under blog (here and here), though I quickly lost the thread of the discussion in the comments as it descended into a string of ad hominem attacks, or ones only loosely connected to the argument I was making in the first place. I do note that several people have noted in various places that South Carolina could quickly get three bishops together if it had to. I acknowledged this in the initial essay, but also noted that this would demonstrate the ad hoc nature of their existence. This essayist misses the point that “extra-provincial” in the present period does not refer to the cases he lists, but emerges in the context of our conflicts and was proposed as a way forward by the Windsor Continuation Group. It is a category overseen by a primatial committee. We have information on this at ACI. Incidentally, even the PB of TEC supported it. We might first note that while the report of the Windsor Continuation Group was “received” by the Anglican Consultative Council, little action has been taken on any of its recommendations. As a result, Seitz’s implicit assertion—that South Carolina has simply taken up some status available to it in the Communion—is not correct, nor is it what South Carolina has been claiming for itself in the last several months. Regardless of which primates supported the idea, it has not, to my knowledge, become an active and viable option in the Anglican Communion, as the absence of a primatial committee in South Carolina makes clear. 100. One way forward – although initially dismissed by some of the parties concerned – would be for ACNA to seek for some clear provisional recognition which seeks to keep it in relation to the Communion, but which acknowledges its provisional and anomalous nature. WCG has explored on previous occasions the idea of “escrow” – the creation of a body which could take on the oversight of these groups on behalf of the Communion, but which recognises the provisionality of such bodies. The group wonders whether there is any mileage in the model of extra-Provincial jurisdictions? In at least one case, such jurisdictions have been recognised as provisional – e.g. in Sri Lanka Such a provision is fraught with difficulties. Such a scheme could not guarantee any particular outcome, the nature of which would be dependent on many factors, including the progress of the Covenant process. The provision would have to be hedged around with all sorts of restrictions, to avoid such a scheme becoming a haven for discontented groups, and institutionalising schism in the life of the Communion. Who would be the metropolitical authority? If all other obstacles were overcome, the WCG would favour a Metropolitical Council similar to that which operates for Cuba rather than linking the new entity to the Archbishop of Canterbury. In other words, the WCG report itself highlights the need for metropolitical authority, which is precisely the point I was making in my initial essay. Rather than contradicting my claim, it seems the WCG accurately forecast the problems that would arise with such an unusual status. No commenter, to my knowledge, has responded to the historical facts I lay out in the essay concerning the South Carolina episcopacy—namely that South Carolina went many years without a bishop and its first bishop was consecrated at a General Convention. These seem of central importance to the current conversation. Still, I welcome the conversation. It is noteworthy to me that none of the more reliably “liberal” Anglican/Episcopal blogs have entered this discussion, even though I think these ecclesiogical issues are of critical importance in ongoing debate about the future direction of the church. On another note, here’s an example of another use of my writing. A group from the Diocese of Fredericton in New Brunswick, Canada went on a mission trip to Ghana and used my book, Grace at the Garbage Dump, to help them reflect on what they were experiencing. Read the full report here. Then download the study guide for the book and do the same on your next trip! The story of this man who had killed a messenger and hanged himself would make interesting reading. One could almost write a whole chapter on him. Perhaps not a whole chapter but a reasonable paragraph, at any rate. The irony, of course, is that the comments come at the end of an entire book about the protagonist. As someone who has written a book about a community of Africans, these words are a constant warning to me. Everyone’s story is full of complexity and I am always trying to find ways to be honest to the story yet not let the writing get bogged down in that complexity. It is not an easy task. Ultimately, however, Achebe was best known for encouraging Africans to tell their own story—that is what he modeled and it is what his growing number of successors continue to do so eloquently. This, I think, is the key: how do we create a world in which everyone has the ability to tell their own story, free from outside interference and the attempt to shape the narratives of others? While we’re working on creating that world, I am constantly humbled by the District Commissioner’s thought: in what ways, am I reducing the stories of others to paragraphs and chapters when whole books are needed? In the last post, we thought about one set of objections to the current system of seminary education: why do priests need to learn all that stuff anyway? But there are other criticisms you hear as well, and they are of a more practical nature. They go something like this: it is unreasonable to expect people to uproot themselves to go to seminary; seminaries are too expensive and leave priests saddled with debt; no one goes to seminary anymore. More importantly, the seminarian debt “crisis” is a result of the Church’s abysmal failure to invest in its future clergy. Our sister denominations give lots of money to their seminarians (as I enviously learned at my ecumenical seminary). The Church of England pays tuition for their ordinands and gives them a living stipend. You only have to read information from the Society for the Increase of Ministry to know that the debt “crisis” could be solved with an increase in small donations from a small number of Episcopalians. Those who point the finger at a debt “crisis” should be asking themselves what role they may have had in creating it. Between this post and the last post, the image of seminary critics I’m gathering is something like the anti-government wing of the Republican party: anti-intellectual, critical of institutions they claim no one uses (contrary to fact), and determined not to fund something and then claiming it’s too expensive when the expense was created by the lack of funding. Although I’m convinced seminaries are important, I’m not convinced that they’re perfect. In the final post in this series, we’ll look at some of the ways they might need to change.